Last Updated: December 8, 2015 | Subscribe to our weekly newsletter! 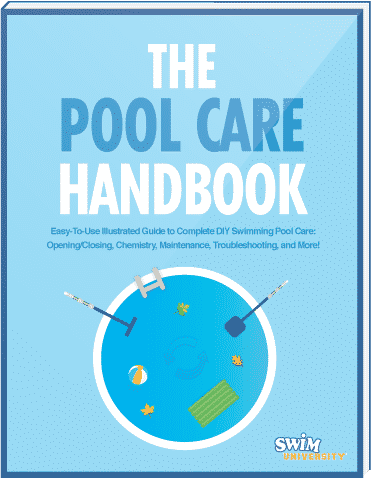 Have you noticed cracks and even holes in the caulk around your pool? They not only look hideous, but the caulk actually serves a very important purpose. Making sure your pool is properly caulked is critical in preventing more serious problems down the road, not to mention improve the look of the areas in and around your pool. With the changes in the weather, your pool will expand and contract. To combat this problem, many pools come with what is called an expansion joint. This joint connects the concrete to your pool allowing it to expand and contract with the changes in temperature. It is sealed with a bead of caulk all around it that is used to keep water out of the joint. Anyone who has a concrete pool probably has an expansion joint around their pool. While most vinyl pools don’t have this type of joint, some do. If you are unsure, just go have a look at your pool and see if there are areas that are caulked. If you find some, you will probably have to replace it and some time or another. Caulk is a great way to keep moisture out of areas where it doesn’t belong. However, it is not a permanent solution. Over time the caulk ages and becomes weak. When this happens, it can dry out and even crack when put under any stress, such as the stress of an expanding and contracting pool area. Once this happens, it is possible for moisture to get in behind the joint. If enough water gets in there it can expand and contract with the weather changes and cause major structural damage to your pool and the area around it. This can result in some pretty expensive repairs down the road. So, if the caulk around your pool is beginning to look old and brittle, it may be time to put down fresh caulk. The end result will be a pool that is not only protected from moisture damage, but also a pool that looks great as well. While you could call in the professionals to help you with this job, it can get expensive. However, this is a great job for any do-it-yourselfer looking to perform as much maintenance as they can on their own. However, you need to be careful. As always, if you don’t feel like you can do the job right on your own, don’t be afraid to call for help. Before you begin, there are a few materials you will need to gather to make sure you are ready to do a proper do it yourself job on your pool’s caulk. Now that you have collected all the supplies you will need, it is time to get started. Keep in mind that while this is a pretty easy job for a do it yourselfer, it isn’t easy work. You will be on your knees bent over your pool working for quite some time, so make sure you are ready. You will want to take your time to make sure you apply the caulk evenly so they end result looks neat and clean. Blow off the entire area around where you plan to caulk so there are no leaves or other debris that could get in the way. Scrap of pull out all of the old caulk in the areas you plan on covering with new caulk. Blow away any remnants and clean it thoroughly before you begin. Ensure the area is dry. Place the foam backer rod inside the crack and press it down firmly so it forms a good base in the area you plan on caulking. Install your caulk in your gun and snip off the end of the caulk. Taking your cardboard and laying it on the ground next to where you are working, gently pull the trigger and run the caulk as evenly as you can across the area. Using your damp cloth, wipe away any caulk that made its way outside of where it was supposed to be. When you must take a break, set the caulking gun onto the cardboard so you don’t have to worry about making any extra messes. Go back over the areas to catch any spots you missed along the way. (Optional) If you like, you can sprinkle a little bit of sand into the caulk in order to better match the color of your concrete. Allow it to dry thoroughly and add another layer only if it is necessary. So what should the end result look like? Check out the image below. If you have done the job right, the caulk will go from edge to edge filling every nook and cranny so that no water may find its way inside. If you still find holes or other areas that need more work, you might be able to add a little more caulk. In some cases, you may need to pull up a small section and re-caulk it so it not only protects, but looks its best. No one wants to deal with major damage to a pool because they didn’t bother to caulk, and caulking is one of the easiest maintenance tasks you can perform to protect your pool and dress it up so it looks its best. So what are you waiting for? Go ahead and pick up your favorite type of caulk and get started cleaning up your pool area so it remains safe from the elements and looks its best. That way you will be proud to entertain your guests poolside when the time comes to throw that big party. When you have to keep a pool full, you start to realize just how expensive water is. Choose a pool water delivery system that works for you and your budget.